Willie James Wilson (born July 9, 1955) is a former professional baseball player. He played nineteen seasons in Major League Baseball for the Kansas City Royals, Oakland Athletics, and Chicago Cubs. He was an outfielder known for his speed and ability as an effective leadoff hitter. Wilson's career total of 668 stolen bases currently ranks him in 12th place all-time among major leaguers. Wilson was a highly regarded high school baseball, football, and basketball player while growing up in Summit, New Jersey where he attended Summit High School. Wilson was drafted out of high school after spurning a University of Maryland football scholarship. The Kansas City Royals picked him in the first round of the 1974 draft. He started his professional career with the Gulf Coast Royals. He moved up to class-A in 1975 for the Waterloo Royals, leading the 1975 Midwest League champions in both RBIs and stolen bases, and in 1976 played for the Double-A Jacksonville Suns. He earned a September call-up in 1976, playing in 12 games. He was mostly used as a pinch runner or defensive replacement, but did start one game on the penultimate day of the season. He had just six at bats, getting one hit and stealing two bases. Wilson began the 1977 season at Triple-A Omaha. In what turned out to be his last minor league action (not counting a stunt appearance in 2009), he batted .281 with 74 stolen bases. He was again called up in September, this time receiving more substantial playing time, batting .324 in 34 at bats with 6 steals. 1978 was Wilson's first full season in the majors. He split the left field job with Tom Poquette, Clint Hurdle and Joe Zdeb, getting the most playing time at the position among the four, while also backing up Amos Otis in center field. Overall, he played in 127 games, but had just 198 at bats while batting .217. Despite his limited playing time, he finished fifth in the American League with 46 stolen bases. He also appeared in three games in the 1978 American League Championship Series against the New York Yankees, starting Game Four. 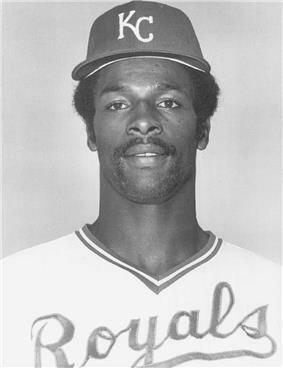 Wilson started the 1979 season as the Royals' fourth outfielder, but by mid-May he had established himself as the team's starting left fielder. He batted .315 and led the league in stolen bases with 83 and singles with 148, while also finishing seventh in hits and third in triples. On defense, he led the league in range factor and putouts and finished second in assists among left fielders. In 1980, Wilson started the year as the starting center fielder when Amos Otis opened the season on the disabled list, and acquitted himself well, posting an above-average range factor and making just one error in 195 total chances for the year in center. He moved back to left when Otis returned in late May, and wound up leading the league in several categories. His 705 official at bats were a major league record until it was surpassed by Jimmy Rollins in 2007. He also led the league in hits, runs scored, triples, and singles, and finished second in steals with 79. He won both the Gold Glove and Silver Slugger Awards, and was fourth in the AL MVP voting, his best finish. In the runs batted in with four as the Royals swept the Yankees in three straight games. In the 1980 World Series, Wilson batted just .154 and struck out against Tug McGraw for the final out of the Royals six-game loss to the Philadelphia Phillies. This strikeout was Wilson's 12th of the Series, breaking the record of 11 held jointly by Eddie Mathews and Wayne Garrett in the 1958 and 1973 World Series, respectively. Ryan Howard would break Wilson's record by striking out 13 times in the 2009 World Series. Wilson's batting average slipped to .303 in the strike-shortened 1981 season, and most of his other numbers were off from the previous two seasons as well. In the 1981 American League Division Series against the Oakland A's, he batted .308, but failed to score a run, steal a base, or get an extra-base hit in the three-game sweep. In 1982, Wilson bounced back to bat .332 and win the AL batting title, the first switch hitter to do so since Mickey Mantle in 1956. Although the Royals missed the playoffs for the first time since 1979, Wilson made his first American League All-Star team that year and winning his second Silver Slugger Award. He led the league in singles for the fourth year in a row and in triples for the second time in three seasons. In 1983, Wilson moved to center field in June when the club decided to shuffle their outfield, moving long-time center fielder Otis to right field, and moving Pat Sheridan and Leon Roberts, who had been sharing right field, over to left. In the midst of the shuffle, Wilson had his worst season at the plate to date, batting just .276. Although he still finished third in the league with 59 stolen bases and made the All-Star Team for the second time, his on-base percentage and slugging percentage also hit what were to that point career lows at .316 and .352 respectively. However, Wilson's problems in 1983 were not limited to on-field issues. After the end of the 1983 season, Wilson found himself in a drug scandal along with teammates Willie Aikens, Vida Blue, and Jerry Martin. All four pleaded guilty to misdemeanor drug charges (attempting to purchase cocaine) on November 17. They became the first active major leaguers to serve jail time, serving 81 days at the Fort Worth, Texas, Federal Correctional Institution. He was suspended by commissioner Bowie Kuhn for the entire 1984 season, but the suspension was reduced on appeal and he was able to return on May 15. The Royals traded or released the other three, with only Wilson returning to the Royals, and he hit .301 and stole 47 bases after his return. In 1985, Wilson batted .278 and led the league in triples for the third time with a career-high 21. He also gained a measure of redemption from the albatross of his 1980 World Series performance, hitting .310 against Toronto in the 1985 ALCS and .367 against the St. Louis Cardinals in the 1985 World Series, as of 2015 the Royals' only World Championship. Wilson remained a fixture in the outfield for the Royals over the next five seasons. Although his bat wasn't what it was in the early part of his career, he still led the league twice more in triples and continued to finish in the top ten in steals, a run of eleven seasons that lasted until 1988, and may have continued if he didn't miss chunks of the 1989 and 1990 season to injuries. He also continued to play well defensively, leading the league in fielding percentage among center fielders in 1987, and among all outfielders in 1990, when he finished the year without a single error. Wilson left the Royals following the 1990 season as a free agent, and he was signed by the Oakland Athletics. There, he took over the role of Félix José, who had been traded late in 1990, as the fourth outfielder behind Rickey Henderson, Dave Henderson and Jose Canseco. He played 113 games, including at least 19 at all three outfield positions, and batted .238. In 1992, Dave Henderson missed most of the season with a hamstring injury, leaving Wilson as the starting center fielder. He played in 132 games, his most since 1988, and batted .270. In his first playoff action since the 1985 World Series, he stole seven bases in the 1992 ALCS against the Toronto Blue Jays, tying Lou Brock's record for steals in one post-season (Brock stole seven bases each in the 1967 and 1968 World Series). He batted just .227, however, and the A's lost the series in six games. Wilson became a free agent again after the 1992 season, and he signed with the Chicago Cubs. He started 1993 in a center field platoon with Dwight Smith, later splitting time with Sammy Sosa when the latter wasn't playing in right field. He batted .258, but managed just seven stolen bases—a career-low for a full season—and he began the 1994 season on the bench behind Tuffy Rhodes. After playing just 17 games that year, he was released on May 16, ending his major league career. Wilson retired with a .285 career batting average and 668 stolen bases, which ranks 12th all-time. For his career, Wilson hit 13 inside-the-park home runs, the most of any major league player playing after 1950. Wilson coached in the Toronto Blue Jays system in 1995 and 1997. He was elected to the Royals Hall of Fame in 2000. In 2003, Wilson was named field manager of the London Monarchs Baseball Club in the fledgling Canadian Baseball League, but the league folded half-way through the 2003 season. Wilson also came out of retirement in 2009, signing a one-day contract with the Kansas City T-Bones, an independent minor league team playing in the Northern League. He currently runs The Willie Wilson Baseball Foundation in Kansas City, MO. ^ Rosen, Byron. "Royal Rookie Will o' Wisp To Claiborne", The Washington Post, May 3, 1978, Accessed February 18, 2011. "NFL draft day found Willie Wilson in New York with baseball's K.C. Royals, and the Associated Press remarked that if the erstwhile Summit, N.J., prep football flash had gone on to play with Maryland after signing a letter of intent, he might have gotten rich as a No. 1 pro football draft pick." ^ "At-Bats Records". Baseball Almanac. Retrieved March 6, 2014. ^ a b "Baseball Drug Suspensions". The Los Angeles Times. August 21, 1997. Retrieved 20 July 2012. ^ Schmuck, Peter (27 October 1992). "Dave Henderson scratched from series". The Baltimore Sun. Retrieved 20 July 2012.